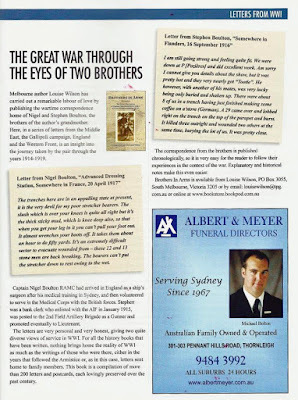 There's a pleasing review of my book Brothers in Arms ... in the latest edition of Reveille, the bi-monthly journal of RSL New South Wales. (Vol 90, No 1, January-February 2017, p 39). The reviewer from the Returned and Services League (RSL) clearly read the book in its entirety, something which authors always appreciate, as many commentators about books take short cuts and simply rehash the back cover blurb. Thank you, Reveille. The Boulton brothers' letters to their mother in Sydney tell the day-to-day life story of a family living through four of the most horrendous years of the twentieth century. 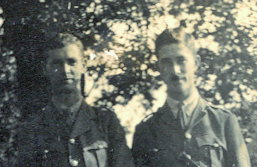 Without detracting from the suffering of the soldiers in that appalling Great War, and those who survived it damaged in mind and body, I felt a bit like a 'wounded soldier' myself as I compiled 'Brothers in Arms'. This is me, sitting on the couch through the autumn of 2015, recovering from an operation on my right leg, one which involved sawing a bone spur off my heel and snipping my achilles tendon. It took months to recover. The computer mouse ran around busily on the tray on my right hand side. I got a crick in my neck checking the typed copies of the letters (on the pillow to my left) against the OCR scan of those letters previously loaded into my laptop. Every now and then I took a break and hoisted myself up to make a cup of tea. Computerised scanning of the output of a 1920s typewriter created a huge number of transcription errors, as everyone who uses the National Library of Australia's wonderful Trove system will affirm. Luckily, as Stephen served with the Australian artillery, his letters were already digitised by the Australian War Memorial so, from my couch, I could easily cross-check the typed verson to the originals. I marked out all the places where the typed version of Nigel's letters did not quite make sense and later visited Canberra to view the originals, not digitised because he served as a doctor with the British forces. Sitting on the couch I could also Google various World War 1 history sites including the digitised unit diaries on the Australian War Memorial's website, thereby obtaining the information I needed for the linking paragraphs between the letters. In case you didn't realise, the Boulton authors of that moving set of letters also feature in Margaret Flockton: A Fragrant Memory. My book about the Royal Botanic Garden Sydney's famous botanical artist was published by Wakefield Press in November 2016. She was Nigel and Stephen's much-loved 'Aunt Mog'.